Stephane Cornicard started working for video games when video games learned to speak. Some twenty years ago, he worked on the initial Final Fantasy and last week, he voiced their latest trailer. Stephan has contributed to over 400 titles, including Dark Soul, Total War, Fable, Primal, Lara Croft, Syphon Filter, Metal Gear, Spyro the Dragon, Colony Wars, Medievil, etc. 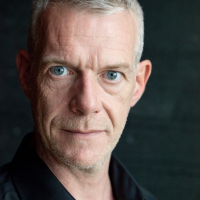 He runs acting and directing workshops for the Actor’s Centre London, British Equity, the Voice Over Network and the French Ministry of Education. He believes that genre snobbery should play no part in an actor’s life and has happily experienced Film, TV, Theatre, Mocap and voice acting in equal measure because a good script is a good script. He is available for work on www.TheVoiceLikeChocolate.com. How do you get actors to give you the best audition sides? How do you coax the best performance? How do you communicate effectively to ensure that they perform how you want them to perform? How do you ensure that the audition sides reflect the true value of each voice actor? This talk will draw on the various methods of actor training to develop a common language, a common vision of the character and save studio time and money. Fun, fast, challenging and informative.